RETRACTABLE MIC KEEPER® SYSTEM … EASY ACCESS, WITHOUT DISLODGING, DRAGGING OR DANGLING. Posted on 18th August 2014 | Comments Off on RETRACTABLE MIC KEEPER® SYSTEM … EASY ACCESS, WITHOUT DISLODGING, DRAGGING OR DANGLING. The retractable tethering device keeps radio microphone in the proper position to maintain effective communications as recommended by International Association of Fire Chiefs. Poor communications is among the top five factors in line-of-duty deaths. According to the National Institute for Occupational Safety and Health’s Fire Fighter Fatality Investigation and Prevention Program, lack of effective communications is one of the leading causes of non-cardiac line of duty deaths among firefighters. 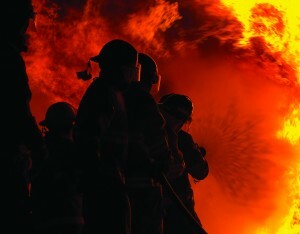 The International Association of Fire Chiefs has developed a series of portable radio best practices that include a recommendation that firefighters place radio microphones in close proximity to the mouth to avoid audio distortion problems when operating in environments with high levels of background noise. IAFC said that firefighters should “ensure that the microphone is placed one to two inches from the mouth or SCBA voice port with the microphone positioned directly in front of the audio source.” A Mic Keeper device is designed to do just that. It keeps the mic securely in the proper IAFC position to operate the microphone appropriately when in use. When released after use, the mic will automatically retract to a secure position leaving the hands free to use other critical firefighting tools. The Mic Keeper is a rugged, retractable system designed to utilize and protect gear in severe environments with maximum break strength and durability. It was developed based on the needs and comments of firefighters complaining about the lapel mic being a nuisance, always becoming dislodged and dangling, causing firefighters to step on or drag their mics. This often happens with strap-type radio belts. Although straps are an easy way to carry the radio for non-turnout gear times and are easy to throw on for turnout conditions they might not be the safest choice. If the strap is worn over the turnout coat to facilitate access to the radio, it becomes an entanglement issue and the radio is not protected. If the strap is under the coat you can not reach the radio. The Mic Keeper is securely attached to a turnout coat or air pack harness with the supplied a stainless steel threaded pin (stud) that penetrates Mic Tab, Radio Pocket, or Webbing Harness and threads into back of Mic Keeper. Built specifically for heavy-duty firefighter use, the retractable tether has a 400¢F, V-2 Flame Rating and is constructed with a nylon coated stainless steel cable, stainless steel spring and hardware. The model RT2-4022 Mic Keeper Pin Mount System allows the microphone to be securely extended for talking/listening, without the Mic being dislodged / dropped or the need to re-clip after use. When necessary, the Mic Keeper’s patented Q/C mounting system quickly and easily disconnects the microphone from the Mic Keeper. The Mic Keeper retails for € 21.99 excl. VAT. More customizing options are available. This entry was posted in GearKeeper and tagged avera, avera - avera bv - avera distributing - avera the netherlands, safety. Bookmark the permalink.